Official client library to help with calling Haven OnDemand APIs http://havenondemand.com. HODClient package for sending HTTP GET/POST requests to Haven OnDemand APIs. HODResponseParser package for parsing JSON responses from Haven OnDemand APIs. The library requires Swift 3.0. Download the HODClient library for iOS. 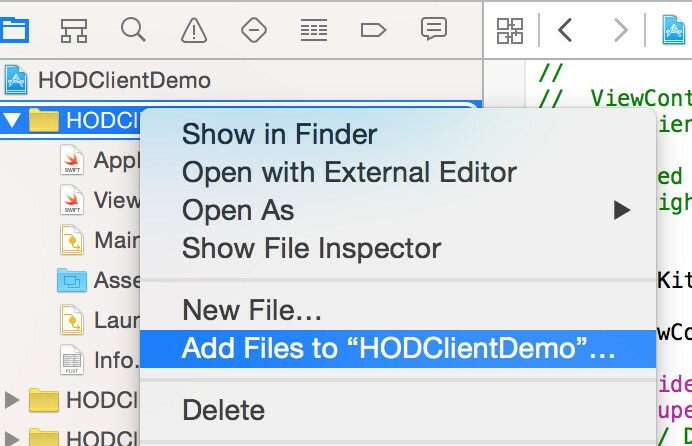 Browse to the folder where you saved the library and select the HODClient.swift file. If you want to use the HODResponseParser library, follow the step 4 to add also the HODResponseParser.swift and HODResponseObjects files. Creates and initializes an HODClient object. version Haven OnDemand API version. Currently it only supports version 1. Thus, the default value is “v1”. Sends a HTTP GET request to call a Haven OnDemand API. params a Dictionary object containing key/value pair parameters to be sent to a Haven OnDemand API, where the keys are the parameters of that API. hodApp a string to identify a Haven OnDemand API. E.g. “extractentities”. Current supported apps are listed in the HODApps object. async specifies API call as asynchronous or synchronous. The default value is true for asynchronous call. If the async is true, response will be returned via the requestCompletedWithJobID(response:String) callback function. If the async is false, response will be returned via the requestCompletedWithContent(response:String) callback function. If there is an error occurred, the error message will be sent via the onErrorOccurred(errorMessage:String) callback function. Sends a HTTP POST request to call a Haven OnDemand API. hodApp a string to identify a Haven OnDemand API. E.g. “ocrdocument”. Current supported apps are listed in the HODApps object. Sends a HTTP GET request to call a combination API. params a Dictionary object containing key/value pair parameters to be sent to a Haven OnDemand combination API, where the keys are the parameters of that API. hodApp a string to identify a Haven OnDemand combination API. // Call a combination API named "ocrtoconcept", which recognizes text from an image and extract the concept of the text. Sends a HTTP POST request to call a combination API. // Call a combination API named "imagetosentiment", which recognizes text from an image and analyze the sentiment of the text. Sends a request to Haven OnDemand to retrieve content identified by the jobID. jobID the job ID returned from a Haven OnDemand API upon an asynchronous call. Sends a request to Haven OnDemand to retrieve status of a job identified by a job ID. If the job is completed, the response will be the result of that job. Otherwise, the response will contain the current status of the job. When you call the GetRequest() or PostRequest() with the ASYNC mode, the response will be returned to this callback function. The response is a JSON string containing the jobID. When you call the GetRequest() or PostRequest() with the SYNC mode or call the GetJobResult() function, the response will be returned to this callback function. The response is a JSON string containing the actual result of the service. If there is an error occurred, the error message will be returned to this callback function. Creates and initializes an HODResponseParser object. Parses a jobID from a json string returned from an asynchronous API call. jsonStr a json string returned from an asynchronous API call. The jobID or nil if not found. Parses a json response from Haven OnDemand Speech Recognition API and returns a SpeechRegconitionResponse object. Note: See the full list of standard parser functions from the Standard response parser functions section at the end of this document. jsonStr a json string returned from a synchronous API call or from the GetJobResult() or GetJobStatus() function. An object containing API’s response values. If there is an error or if the job is not completed (callback from a GetJobStatus call), the returned object is nil and the error or job status can be accessed by calling the GetLastError() function. result += "Sentiment: " + i.sentiment + "\n"
result += "Score: " + String(format:"%.6f",i.score) + "\n"
result += "Topic: " + i.topic + "\n"
result += "Statement: " + i.original_text + "\n"
result += "Length: " + String(format:"%d",i.original_length) + "\n"
result += "Sentiment: " + resp.aggregate.sentiment + "\n"
Parses a json string and returns the result as an NSDictionary object. You will need to define a custom class and parse the result into that class. See example below for more details. A NSDictionary object containing API’s result values. If there is an error or if the job is not completed (callback from a GetJobStatus call), the returned object is nil and the error or job status can be accessed by calling the GetLastError() function. let keyName:String = (key as? String)! let keyValue:NSArray = (value as? NSArray)! var original_text: String = ""
var type: String = ""
let keyValue:NSDictionary = (value as? NSDictionary)! result += ent.normalized_text + "\n"
result += ent.type + "\n"
Get the latest error(s) if any happened during parsing the json string or HOD error returned from HOD server. Note: The job “queued” or “in progress” status is also considered as an error situation. See the example below for how to detect and handle error status. people += ent.normalized_text + "\n"
places += ent.normalized_text + "\n"
errorStr = "Error code: " + String(format: "%d", err.error) + "\n"
errorStr += "Error reason: " + err.reason + "\n"
errorStr += "Error detail: " + err.detail + "\n"
errorStr += "Error jobID: " + err.jobID + "\n"
* the jobID and send a request for the actual content identified by the jobID. var result = "Scanned text:\n"
result += "Text: " + i.text + "\n"
result += "Top/Left: " + String(format: "%d/%d", i.top, i.left) + "\n"